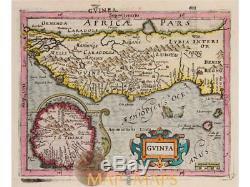 Guinea Africa Mercator Hondius map 1634. 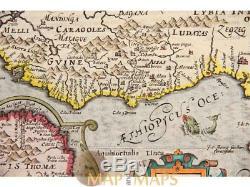 Antique map of the gulf of Guinea with Island St. Thomae, (Portuguese province), a sea monster near the coast. Origin atlas: Atlas minor Gerardi Mercatoris, a I. Hondio plurimis aeneis tabulis auctus et illustratus. Amsterodami Excusum in aedibus Iudoci Hondij, venunt etiam apud Corneliu Nicolai, item apud Ioannem Ianssoniu Arnhemi. Place of Publication Amsterdam 1634. ORIGINAL ANTIQUE COPPER PLATE ENGRAVING, HAND COLORED. 16th -17th -18th-19th Century maps & atlases & prints. We sell guaranteed Absolutely Original authentic Maps and Prints. A Certificate of Authenticity (COA) will be supplied on request. 8.75 x 7 inches. Condition: Nice map in very good condition. All maps and prints are genuine, authentic, published at the date stated in this listing! Always real antique maps - Always original - Never reproductions. For better quality pictures please go to our web site. All maps and prints are genuine, authentic, published at the date stated above. 3 day's Global Express Courier Services on request. 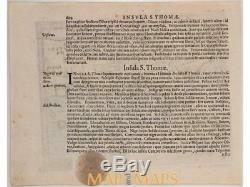 The item "Guinea Africa Mercator Hondius map 1634" is in sale since Saturday, August 25, 2018. This item is in the category "Antiques\Maps, Atlases & Globes\Africa Maps".